Unusual shapes and growths can be alarming anywhere in the body. 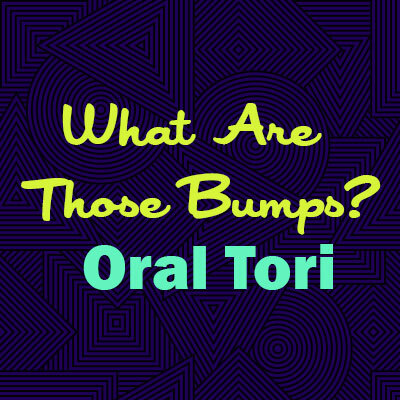 If you’ve noticed hard bumps growing in your mouth, you might have oral tori. Tori are more common among males than females. (Although palatal tori are twice as likely to occur in women than men.) They appear to be genetic. Tori can appear in groups of various shapes and sizes, or you can have a just one torus. If you have a torus on one side of your mouth, it’s most likely that you’ll have another one on the other side. Tori have been referenced and studied for at least 100 years, but truth be told, we don’t totally understand what causes them. Some dentists believe that people who grind their teeth and clench their jaw are more likely to develop tori. Others believe that tori result from facial or jaw injuries or trauma. Tori are considered normal and harmless. Phew! Tori may, however, get in the way of dentures or orthodontics in some cases. Or they may grow to a point and touch in the middle of the mouth. In these cases, your dentist may recommend treatment and removal to ensure optimum comfort and function. So long as they don’t interfere with your daily life and ability to eat, speak, or care for your oral health, tori are not a problem. Tori should not hurt but they can get injured if you accidentally scrape them while eating. If this happens, keep the wound clean with mouthwash or a saline rinse to prevent infection. Although they are extra growths, tori are not cancerous. Signs of oral cancer include sores, thickening oral tissues, unexplained bleeding or numbness, trouble swallowing, and a change in how your dentures fit. If you have any concern about oral cancer, you should come see us today for an oral cancer screening. Your Belleville dentist will monitor the tori shape and size and how they affect your general health. In the rare case that you do need the tori to be removed, your dentist or oral surgeon will perform the oral surgery procedure. The oral surgeon will expose the bone tissue, remove it, and level the mouth surface. As with any surgery, you’ll be sore for a while afterward, and you’ll see the dentist about a week later for a post-op checkup. If you need help living with tori, or you have any other oral health need, come see us at Neighborhood Smiles in Belleville today. Dr. Yakowicz is a professional dentist and our team can help you achieve the beautiful, healthy smile you deserve. Make an appointment today!